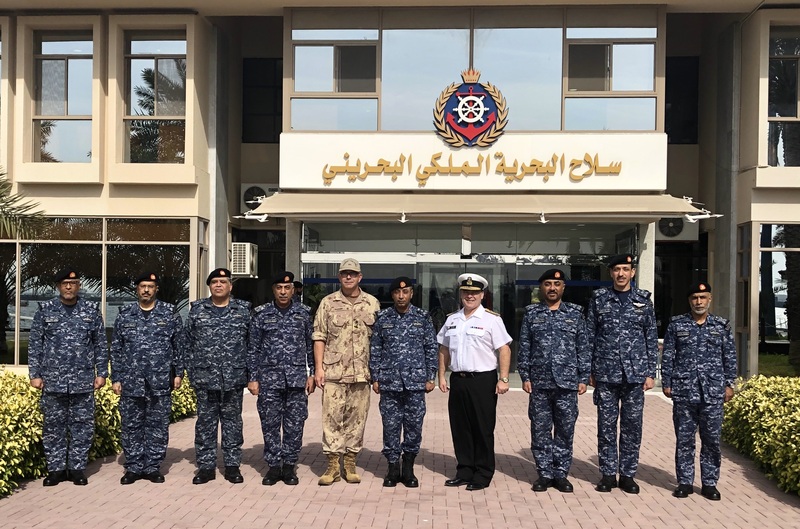 RAdm Craig Baines, Commander MARLANT and Maritime Component Command (MCC), visited Manama, Bahrain from January 14-15, 2019 for a series of key leadership engagements and to visit Commodore Darren Garnier and the Canada-led Combined Task Force (CTF) 150 team responsible for counter-terrorism and deterring illicit maritime activities in the Western Indian Ocean and Middle Eastern waters. RAdm Baines’ first meeting with VAdm James Malloy, USN, Commander Combined Maritime Forces (CMF), enabled discussions on Canada’s valued contribution to CMF and the great achievements of the CTF 150 Task Force since the Canadian Armed Forces (CAF) took command on December 6, 2018. Only a week prior to RAdm Baines’ arrival, CTF 150 conducted its sixth drug seizure in six weeks, adding up to a total of 14,357 kg of illicit narcotics seized to date. RAdm Baines was also invited to join the CMF Command Team for the Command Update Brief (CUB) located at United States Naval Forces Central Command (NAVCENT) Headquarters. It was an opportunity for RAdm Baines to witness the CMF coalition partnership at work. Countries from all over the world are represented at the CUB, including Canada, the United Kingdom, Australia, France, Kuwait, Italy, Denmark, and Brazil to name a few. “I’d like to thank CMF for the warm welcome and outstanding hospitality,” said RAdm Baines when addressing coalition members at the CUB. On January 15, RAdm Baines and Commodore Garnier visited Commodore Mohammed Yousif Al Asam, Commander Royal Bahrain Naval (RBN) Force, who are also members of the CMF coalition. The CAF and Royal Canadian Navy (RCN) have been deploying personnel to Bahrain for Operation ARTEMIS and Operation FOUNDATION successfully for many years, contributing to counter terrorism and providing continual CAF presence. The meeting was an opportunity to thank Commodore Al Asam for RBN support to CAF operations in the area, and to strengthen RCN / RBN relationships. “Thank you for being so welcoming to Canadians. We feel very comfortable sending our sailors to Bahrain, and it’s an honour to visit,” said RAdm Baines. RAdm Baines also spent time with the combined Canadian – Australian CTF 150 team during his visit and thanked them for their hard work. CTF 150 is under CAF command from December 2018 until April 2019. Through maritime security operations, regional engagements, and capacity building activities, CTF 150 works to deter and deny terrorist organizations the use of benefits from using the high seas for smuggling illicit cargo including narcotics, UN embargoed weapons, and Somali charcoal.